Wherever you lie on the Halloween spectrum—from “I live for this holiday and will crush every single costume contest” to “Can I please disappear until November?”—you’ll have to acknowledge October 31 one way or the other. And whether you’re attending the most lavish Halloween party of the year or simply humoring family members with a little trick-or-treating, some form of a costume is usually required. If the idea of renting an outfit or visiting a Halloween store is just more than you can handle, we’ve got you covered with a handful of chic ideas using totally wearable pieces from H&M. Shop all our favorite costume ideas below, and then sit back with a bucket of candy and wait for the festivities to begin. Going All-Out for a Friend’s Costume Party? When it comes to Halloween costumes, you don’t go halfway—you commit. Your friends can count on you (and your ensemble) to be the conversation starter for the evening, and the last thing you want to do is disappoint them. Choose from these statement pieces and take home the costume prize yet again. 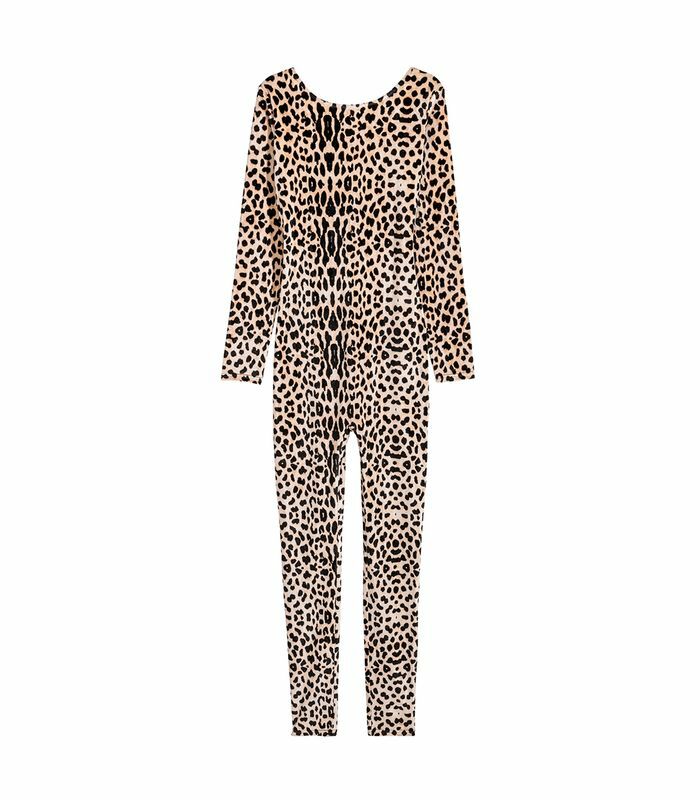 If you’re looking to turn heads at your spooky soirée, this leopard catsuit has your name on it. Embrace a Scary Spice look with statement jewelry and sky-high platform heels—we’ll leave you to figure out those cone-shaped hair horns. There seems to be a 50/50 chance that Halloween on the East Coast will be the first snow storm of the season—this faux-fur coat will keep you warm without ruining your Mel B. vibe. Season 2 of Stranger Things debuts October 27, so it will be super top of mind come Halloween. Pay homage to everyone’s favorite character, Barbara Holland, aka “Barb,” with this pair of light high-waisted ’80s-vibe jeans and flannel tunic tucked in. Don’t forget your three-ring binder, oversize glasses, blue eye shadow, and a red bob-style wig—at very least, you’ll still be wearing this chic denim long after October 31. For you, over-the-top Halloween parties may have lost their appeal, but your little relatives still need you to show them the ropes of trick-or-treating. You’ll want a playful costume the kids will love while still being comfortable enough to walk around the neighborhood. Shop these sweatshirts, pair them with a matching bottom half if the mood strikes you, and let the candy collecting begin. This “Cheerleader” sweatshirt is the perfect start to a spirited costume (see what we did there?). Keep things super low-key by just adding a ribboned high ponytail and homemade pom-poms. Take it up a notch by throwing on classic Converse sneakers and this cute retro skirt—add creepy zombie-cheerleader makeup if scaring the kids is a little more your vibe. For the perfect amount of kid-friendly scary, opt for this skeleton-print sweatshirt. In the spirit of buying pieces you’ll wear all season, pick up this pumpkin-esque sweater and accessorize with quirky Halloween jewelry—the tackier the better. These Halloween-print leggings take us back to the glory days when we were the ones trick-or-treating for the first time. You know those adorable kids who go out wearing super-comfortable spooky pj’s? That could be you. Forced to Dress Up for an Office Party? With Halloween falling on a Tuesday this year, your office went ahead and decided to schedule some daytime festivities. Costumes are encouraged, but let’s face it: You actually have meetings to go to. Snag one of these festive pieces to strike a balance between costume and corporate. This appropriately vampy sweater is the perfect nod to Halloween without being completely over the top. Pair it with this black leather miniskirt, heeled boots, and ample liquid eyeliner for a chic, edgy look that doesn’t feel silly on your commute home. Here’s your second option for a sweater that provides Halloween vibes with minimal effort. If your building is still blasting summer-strength A/C, this evil-eye knit will keep you festive and cozy. If your office is more on the casual side, opt for high-waisted black denim to finish the look. Up the ante (if need be) with the addition of black lipstick or a dollar-store headband. Keep things Halloween-corporate with this little black dress that just happens to have a skeleton pattern on it. Pair it with heels and a statement belt (even skeletons like to accentuate their waists). Halloween is just around the corner. Shop these chic last-minute costume ideas—and a whole lot more—now at H&M.